Assessment in my music room follows a gradual release of responsibility model. 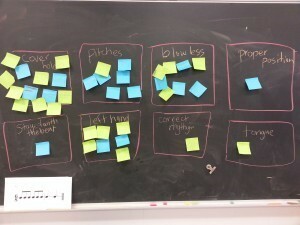 I explicitly teach students how to self-assess their ability to create and play a song correctly. I do this regularly throughout the year as we learn how to play different instruments, songs and arrangements. 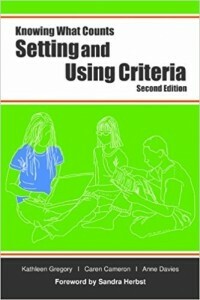 Near the beginning of a new unit, the students and I co-create criteria using Anne Davies’ Model. This process helps me understand where my students are in their assessment for learning and often identifies areas where they will need help. 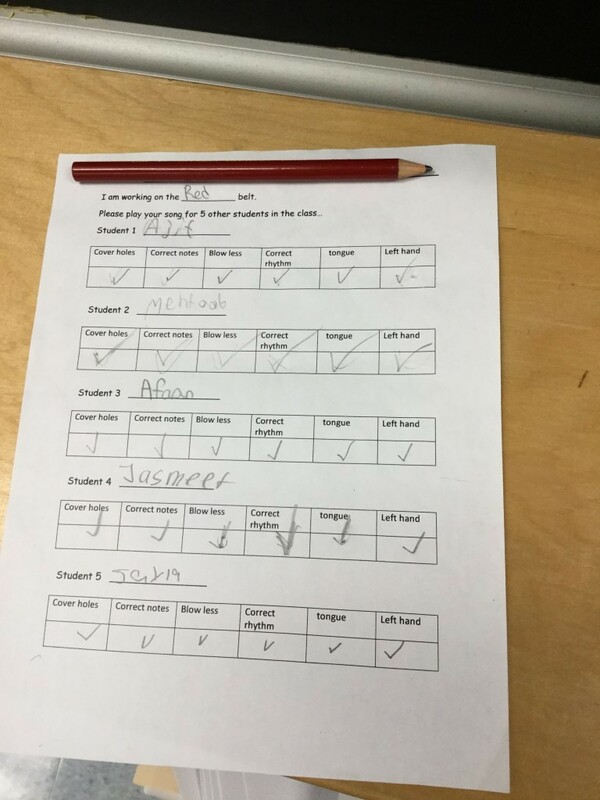 You can see from the picture below that my students really understand the idea that you are supposed to cover the holes when you are playing music on the recorder, but tonguing is something that this class needed a lot of help with, as only one student used it as part of the criteria. The criteria that we create is used in all subsequent lessons to help students have a deep understanding of how they can be successful. After we have written the criteria, I have the students use the criteria to assess me while I am performing a piece of music. I explain thoroughly each part of the criteria as I demonstrate what a level 4 looks like. 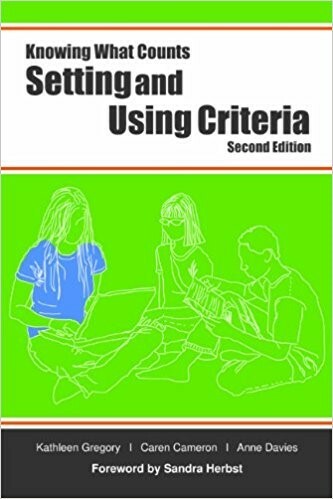 In the next three or four classes that follow, I do a warm up using the criteria until I feel that the class has a firm grasp on how they will be assessed. I want them to be empowered to be able to explain and use the criteria that we have created. In the warm up, I play for them and they give me feedback. I fill in the gaps or explain any pieces of the criteria that they are not fully understanding. After students have some understanding of how they will assess themselves, they spend time receiving feedback from both me and their peers. They play for me in person and through Google Classrooms. After the first couple of times that they play with me, I ask them to assess themselves with my support. I train them to express their next steps orally with me in small groups or one on one. For those students who need further practice, I do small group instruction where they play and we work through each part of the criteria until they understand it fully. 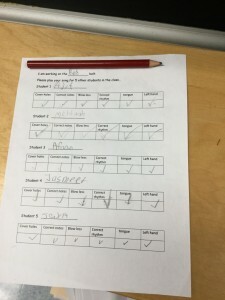 Once each student is able to fully assess themselves confidently, they have so much ownership over their growth and I focus on helping them achieve as much as they can in one year! My assessment of learning is always a celebration of how far the students have come. I always make it a point to show them their progress as they move through various units, so that they have confidence in their abilities. This process takes quite a bit of time, but it is well worth the skills that the students acquire. The skills required to be able to identify areas of need are the skills that will carry our students through much bigger challenges than Hot Cross Buns on the recorder.